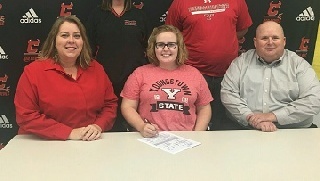 Two-time state tournament qualifier Emma Dockery has signed a National Letter of Intent to continue her academic and bowling career at Youngstown State, Penguins head coach Chelsea Gilliam announced. Dockery currently attends Crestwood Local High School in Portage County. "Emma has had a lot of tournament experience throughout her high school career," Gilliam said. "She has competed at the state level for high school but also Junior Gold and Teen Masters for the last three years. Seeing this kind of competition is going to be very beneficial for her and the team as she begins her freshman year with us. "She has had a lot of success on the lanes but is also very dedicated in the classroom. I am looking forward to bringing Emma in next fall and be a part of her continued success at the collegiate level." Dockery has posted an average of at least 182 in each of three of her high school seasons. Last season as a junior her average was a career-best 193 as she was named the Portage Trail Conference Bowler of the Year. She finished 19th at the Ohio state tournament, and she placed 10th at the Teen Masters Tournament. Dockery also qualified for the Junior Gold Championships, an annual national tournament for the top bowlers in the country. As a sophomore, Dockery qualified for the state tournament for the first time and was named First-Team All-PTC. She posted a 188 average in leading the Red Devils to their first conference title in program history. She finished in the top five in nine of the 10 tournament in which she competed. Dockery had a 182 average as a first-team all-conference bowler as a freshman. Dockery is the first member of YSU's second signing class in program history. The Penguins are in their first year of competition in 2016-17.